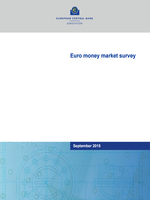 MEMOFIN - Euro money market survey - September 2015 - L'information financière que vous ne trouvez nulle part ailleurs ! Market experts from the European System of Central Banks (ESCB) produce an annual survey of developments in the euro area money market (Euro Money Market Survey), consisting of a large number of charts. In addition, the ESCB produces a Euro Money Market Study every other year, which contains an in-depth analysis of euro area money market developments. The survey and study form part of the ESCB’s regular monitoring activities. They cover the second quarter (Q2) of each year. Each of the 149 banks participating in 2015 reported their total quarterly turnover in each of the money market segments during this period.